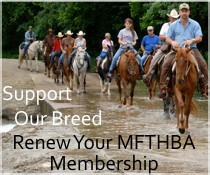 KCRFTHA Board Member Chastity Young participates in a ranch sorting event during one of the MFTHBA shows. The Kansas City Regional Fox Trotting Horse Association, an MFTHBA affiliate, is hosting a ranch riding and sorting clinic this coming March. 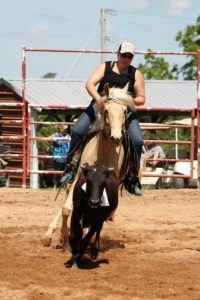 The two day clinic will provide attendees an opportunity to learn about ranch riding classes and to be introduced to the sport of ranch sorting. The clinic will be held at the Missouri State Fairgrounds in Sedalia, Missouri. Scheduled for March 29 and 30, the weekend will end with a ranch sorting jackpot. Jeff Holman and Cornerstone Productions will be conducting the clinic. The clinic and jackpot are only open to gaited horses. Participants do not need to be current KCRFTHA members to attend.